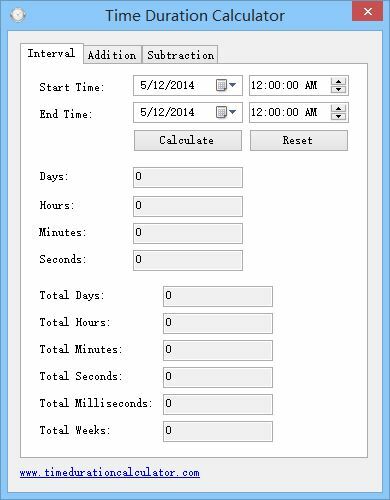 Time Duration Calculator is a free date time interval calculator, it can help you to quickly calculate duration between two time, and it supports three calculations: Interval calculation, Addition calculation and Subtraction calculation. 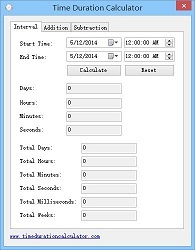 This software is a Freeware, simple and easy to use. 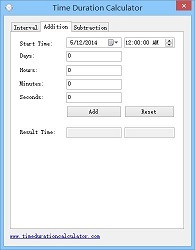 Enter the Start Time and the End Time, then hit "Calculate" button, software will calculate the time span value, and tell you how much hours, minutes, and seconds between two time, in addition, software will show some useful total values, including Total Days, Total Hours, Total Minutes, Total Seconds, Total Milliseconds and Total Weeks. 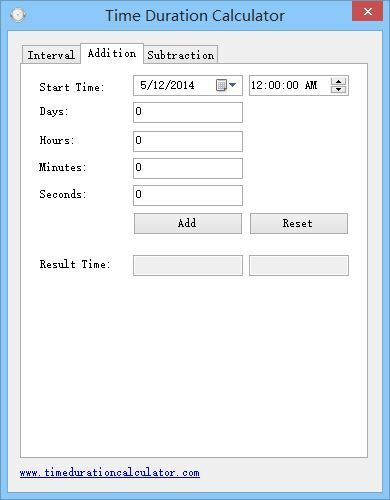 Enter a Start Time and the time value you want to increase, such as the number of days, hours, minutes and seconds, then hit "Add" button, software will calculate a sum value. 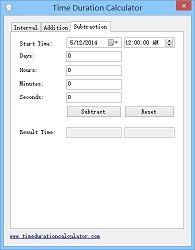 For days, hours and minutes, you can use float number, for example: 0.6 days, 0.2 hours, 0.3 minutes, and so on. 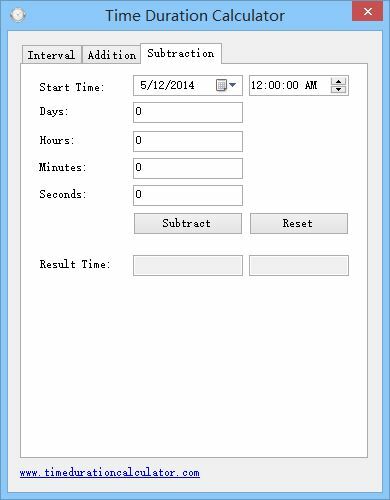 Enter a Start Time and the time value you want to decrease, such as the number of days, hours, minutes and seconds, then hit "Subtract" button, software will calculate a result value. For days, hours and minutes, you can use float number too. Copyright © TimeDurationCalculator.com, All Rights Reserved.